This article has been updated and all copyright images of Trash Doves taken out as per request of the creator. The post will now have less images in place and CENSOR ALL TRASH DOVE pictures that are the work on the original artist. If you’ve been an observer of the shenanigans of the Alt Right and their hateful Nazi propaganda, then you must have heard of Pepe the Frog. Pepe is a truly disgusting frog which has been used as a symbol to spread hate online and harass journalists and those that disagree with the Alt Right(Reich)*sic. Most recently, these Nazis have attempted to use this symbol to “meme Marine Le Pen into office”, similar to the way they harnessed “Meme Magick” to elect Donald Trump in 2016. Anyway, that was a quick rundown on the history of the Alt Right and their hateful propaganda. So, What About The Trash Doves? The Trash Doves have become a new symbol of hate for the Alt Reich Hitler worshipers. 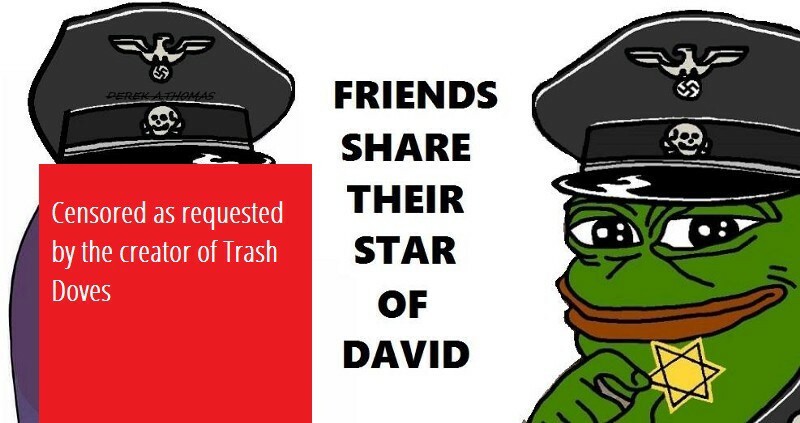 The Trash doves appeared as a “normie meme” near the end of January 2017, but by early February, the Alt Right had managed to take the bird back from the normies. Trash Doves is a set of Facebook stickers featuring a large-eyed purple pigeon in various situations, the most notable of which is an animated sprite of the bird vigorously thrashing its head up and down. Shortly after its debut on Facebook in January 2016, the purple dove sticker set quickly became a viral subject of photoshopped parodies and image macros on the social media. Florida artist and Adobe creative resident Syd Weller’s “Trash Doves” sticker set officially made its Facebook debut on January 31st, 2017, which included an animated emoji of a headbanging pigeon (shown below). Their madness doesn’t end, I could post thousands of these from my time spent deep undercover in these hate groups. 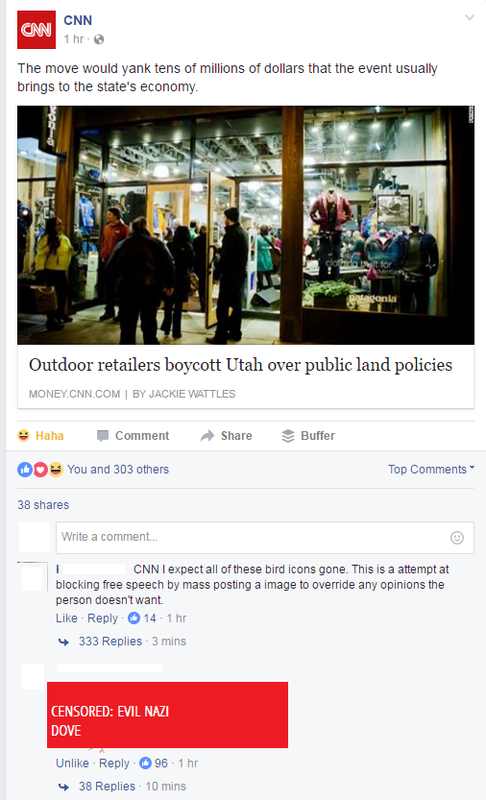 The Alt Righters teamed up on the early morning hours of February 13th and began to flock to liberal pages like CNN and post the Facebook stickers of these hateful birds. Some rumors say that they are trying to block free speech of those whom’st they don’t agree with by creating chaos and madness with “cute purple birds”, otherwise looking non suspicious to the average observer. But, as a dedicated undercover Meme War investigative journalist, I can tell you this; these birds are far from “cute”. They are a hate symbol and need to be recognized as such, immediately! They are flooding the comment section and not allowing ideas to be properly expressed. 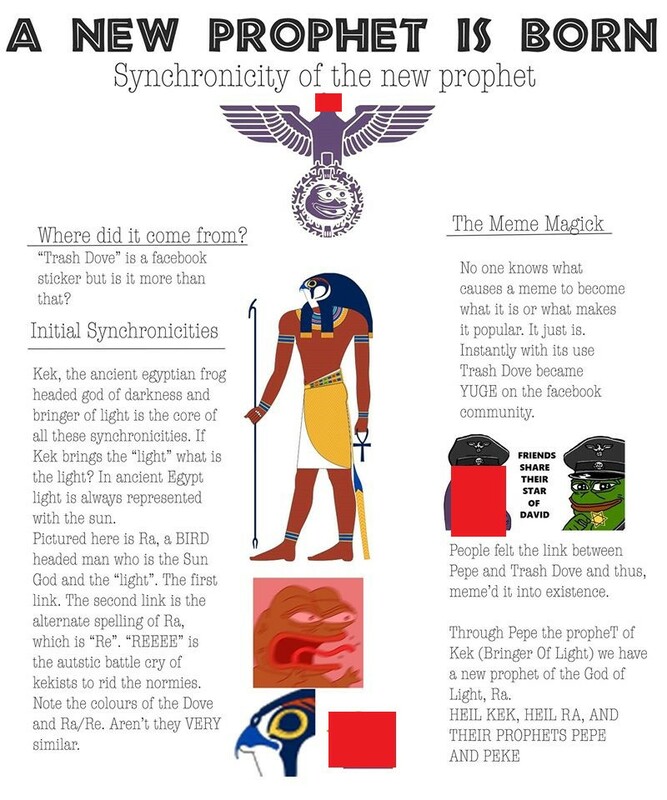 My deep undercover investigative journalism has led me to a comment posted on a thread about Hitler on another thread about Kek taking the bog pill while Baneposting and praising Horus and Thoth on 4chan and the relevance to the hateful Hitler bird. “CNN has disabled all comments on their Facebook page. Occupy Democrats has disabled all image posting. The opening salvo of Meme War II has been a resounding success. Congratulations, goys and girls, we’re reaching unheard of levels of tactical memetic warfare. edit: apparently CNN has their comments on again. It definitely was not working earlier today, though. Hard to say if they just fucked something up or did it purposely. The “Editening”? more like the sickening, amirite? 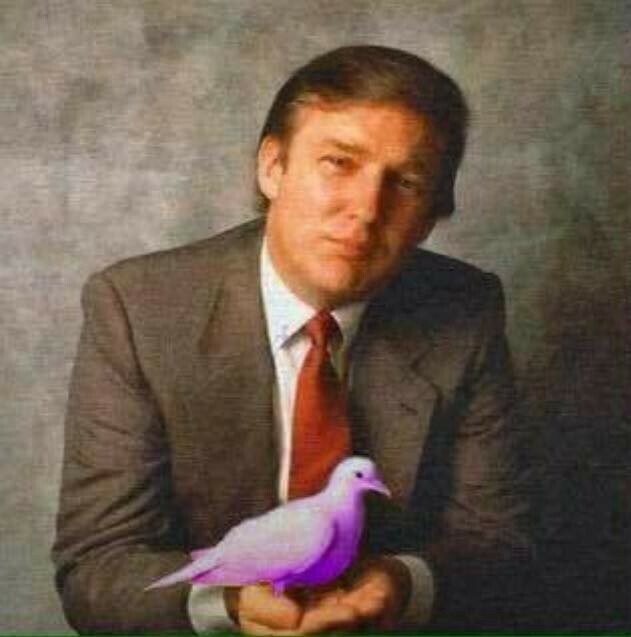 Of course they had to “Make Trash Dove Great Again” too right? Their sickness knows no bounds. What first alerted me to this awful bird of hate was this hero that shared this awesome post of awareness about the evil and wickedness of Trash Dove. Without this post by the true patriot and hero Tommy J Efferson, this article today would not be possible. This is the new “low key” symbol of racism that the Alt-Right is Using. 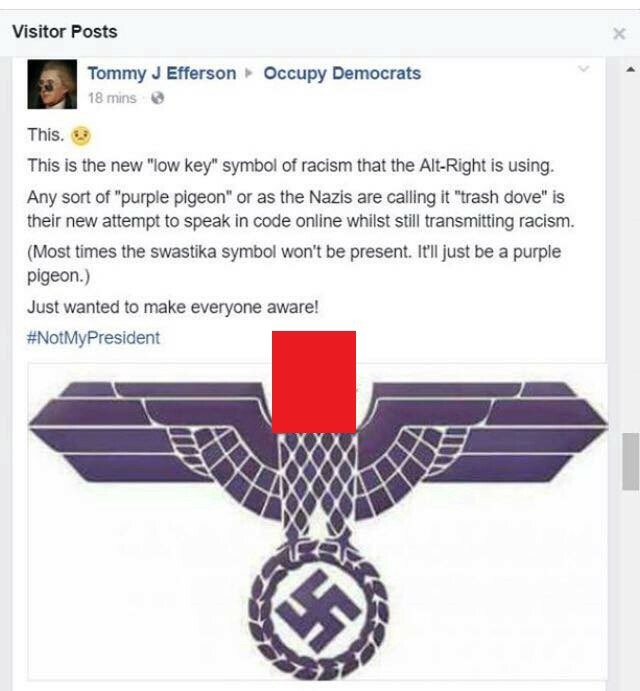 Any sort of “purple pigeon” or as the Nazis are calling it “trash dove” is their new attempt to speak in code online whilst still transmitting racism. The Alt Right is known to have ties to the ancient Egyptian Gods. 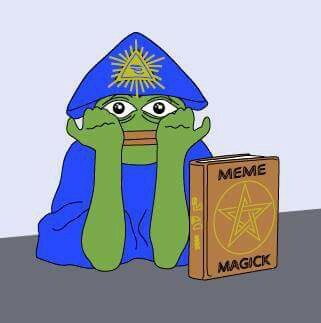 They are said to harness memetic abilities that can “shitpost” ancient Egyptian Gods into reality. It started with the worship of Pepe manifesting into the God known as Kek. Now we have Peck, but, Peck is simply the name of the messenger and not the messiah. 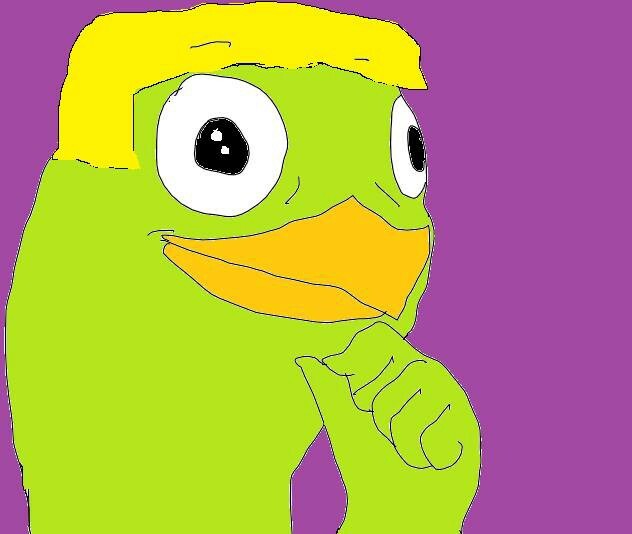 Peck is the “Pepe” of the Bird God. We are not sure which Egyptian God the Alt Right is trying with Peck at this moment. Insider sources believe it may be Thoth or Horus. The story is still fresh and breaking, we will be watching these sickos and covering their madness with these Trash Doves of Hitler. There are harmless versions of the meme and it has been spread to us normal folk too, I admit, I fell for the meme of the “cute birds” when they appeared. But, once I saw the post informing me about the true meaning and realized the Hitler worship that goes into this meme, I was sickened and had to go repent. Zack Normandin commented on this post to with a link to a site that gives a rough breakdown of what the stickers mean. It is quite disturbing stuff as you will read below. “There are 24 Trash Dove stickers on Facebook and you’re able to use them in messages as well as comments. 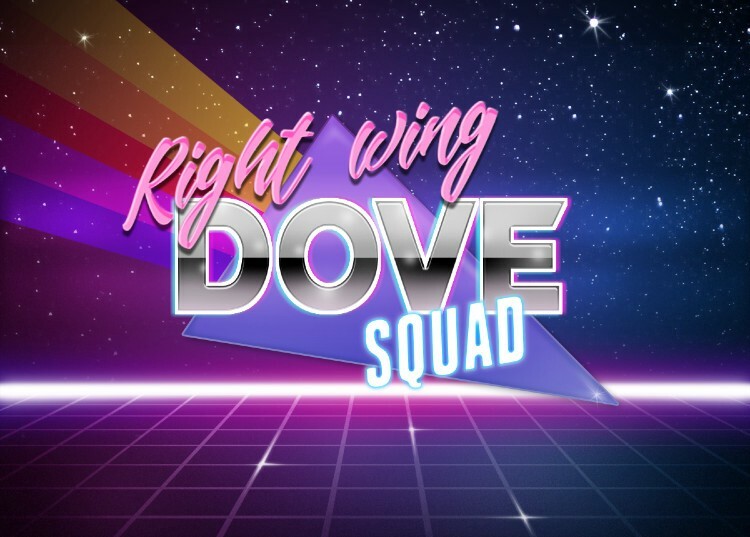 If you are currently uneducated on the true meaning behind the Trash Dove, we recommend you read our post about how Trash Dove stickers now belong to modern-day white supremacists and the alt-right. Each of the 24 stickers has it’s own unique meaning according to the alt-right community. After thorough investigation on the reality of this ordeal, we have a valid description for each individual sticker. Remember that the one eye always represents the Eye of Horus. The Birthday Dove is praising April 20th which is Hitler’s birthday. This sticker is mainly used in the month of April to give thanks to Adolf Hitler and a general salute to the Nazi Party. The Pizza Dove represents a food offering to a fellow soldier in the future Nazi Regime.The 4 pieces of Pepperoni once again represent the month of April. 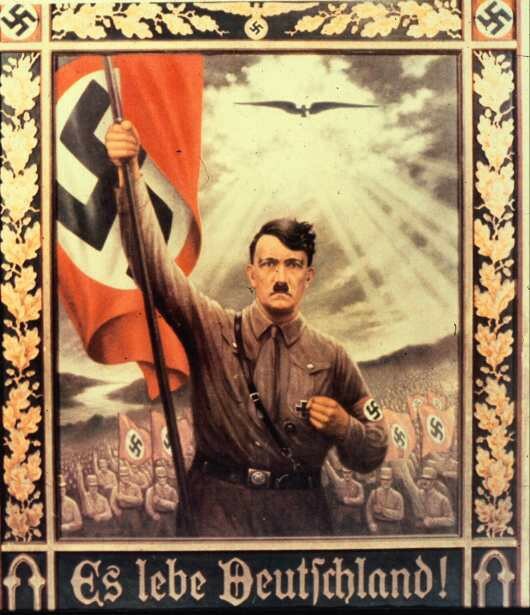 As you can see, the Bowing Dove is simply worshiping the Nazi Ideologies and plans that are soon to come. This is an important piece of material as it will be used more often in the coming months. This Dove is “on a roll” which depicts a bread roll. This is a piece of blasphame against God. The bread represents Jesus and the bird represents the Nazi Party “on a roll” which means it won’t stop. The Love Dove represents one’s love for white supremacy and hatred of other races. Very self-explanatory. The “crumbs” represent the ashes of the Jews who were incinerated. The rain represents the falling of the Nazi Party. One of the saddest Trash Dove stickers and is rarely used. This Dove is looking for something. Could it be the answer to the Jewish Question? This Dove is a detective. He is searching for remaining Jews to burn. This Dove is kissing an unknown white Dove which is thought to be the Caucasian race. This sticker represents the Eye of Horus raining down on those who disobey. This Dove loves bread. In this case, the bread is code for murdering Jews. This Dove is used to represent the current state of the Nazi Party. It is mainly dead but will soon be resurrected. This Dove is a “breadwinner” which means 2 things. It means that it has destroyed the Jews and it also means that it desires to take the place of God. This Dove is “Loafin’ Around” which means to consume the blood of the Jews. It’s basically the same as “Breadwinner Dove” in a sense. This Dove is heavily intoxicated with power over the Jewish people as well as all other races. This Dove is acting as casual as possible. Just like most alt-rights these days, they all dress and act normally with a sense of innocence until the Nazi Party is resurrected. What Business does this Dove have? This Dove has it’s head through a donut hole. This is representing the Invasion of Poland in 1939. This Dove is in full-attack mode. This Dove is ready to kill anybody of any race and should only be used when situations get out of hand. This Dove is wearing boots and a hat while standing in a puddle. The boots and hat represent the power of the Nazi Party while the puddle represents the falling of the party long ago. This is symbolic for rebirth or resurrection. This Dove is using a Smartphone. 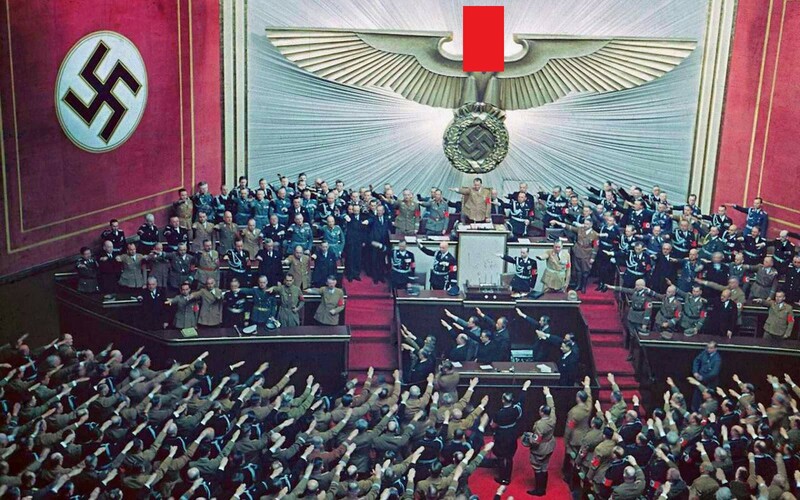 Smartphones are currently being used to develop the Fourth Reich. This Dove is probably posting to Facebook or 4Chan about future plans. Probably the biggest weapon that neo-nazis and the alt-right have. This Dove is constantly performing an advanced Nazi salute that never stops. This is used to flood post comments to announce the development of the Fourth Reich. This Dove is using a bread bowl as a hat and as a habitat. In this case, the bird represents the Fourth Reich and the bread bowl represents Facebook which is created by Mark Zuckerberg, a Jewish man. This Dove is drinking the tears of the leftists and the blood of the Jews. We will continue to update this article as more info comes in. Quincy Frey is an author, philosopher, scientist, musician and investigative meme war journalist that graduated with a PHD from the University of LMGTFY.